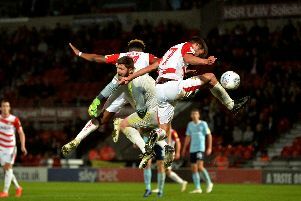 Darren Ferguson is predicting a wide open game when Doncaster Rovers visit Charlton Athletic this weekend. Rovers head to The Valley looking to secure back-to-back wins for the first time this season after the 4-1 win over Southend United on Saturday. And Ferguson says his side will have to be on their guard against the expansive Addicks. “They’re a good team, a very good footballing team, very open,” Ferguson told the Free Press. “They make the pitch very big. A typical Karl Robinson team. “It’s a game I’m looking forward to. It’s a good stadium, a good crowd. “It’s certainly a game we can go there and win. It’s a good footballing team with some very good individuals. “We’ll do all our work as normal. “I think they make the game very big, like ourselves, quite expansive. “There’s certain things we’ll have to do well on and off the ball. “I know exactly what I’m going to do against them and we’ve worked on one or two things already, shape-wise. Charlton ended a four-match winless run with a 3-1 triumph at Fleetwood Town last weekend. Robinson’s side currently sit in sixth spot in League One. Matty Blair may be in line for a recall for Rovers after starting on the bench last weekend. Blair had been carrying a knock while Ferguson said he felt the wide man may have needed a break following a difficult year personally, with the death of his brother. He said: “I’ve just got to be careful with Matty with everything that has gone on. “He just took a bit of a knock and there’s the other situations that have been going on. I’ve got to be mindful of that. “I went with Niall Mason and Harry Toffolo as my full backs last weekend. Darren Ferguson is likely to name an unchanged side following the 4-1 win over Southend United. Rodney Kongolo is back from international duty. This fixture will forever evoke memories of the day Rovers went to The Valley, led 3-1 at half time, only for the game to be then abandoned due to a waterlogged pitch. Rovers lost 2-0 in the rescheduled match in November and went on to be relegated from the Championship - on goal difference. Charlton boss Karl Robinson praised the character of his new-look side following their recent draw with Walsall.